The following is an excerpt from a much longer talk I gave earlier this month at the Blessed John Paul II Shrine in Washington, D.C. (owned and operated by the Knights of Columbus). 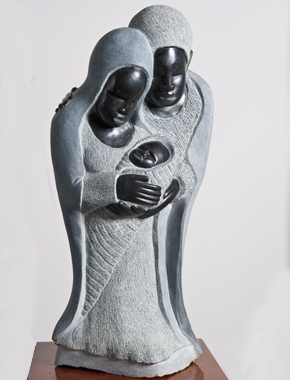 The talk was part of the Year of Faith Lecture Series and was given in conjunction with the Shrine’s Christmas exhibition, “Christmas Across Africa.” I post this in honor of The Holy Family of Jesus, Mary and Joseph. Enjoy! From 1974 through 1979, the groundbreaking situation comedy Good Times aired on CBS. Good Times followed the challenges and joys of the close-knit Evans family who lived in a housing project in inner city Chicago. Episodes of Good Times dealt with the characters’ attempts to “get by” despite overwhelming odds. The episodes were usually more uplifting and positive than melancholic as television audiences around the country watched the Evans family struggle and persevere together. The Evans family represented the undaunted determination echoed in the lives of so many families throughout history. James and Florida Evans epitomized a long tradition of parents striving to open doors for their children, creating opportunities for them to succeed despite the seemingly insurmountable barriers. In the face of tremendous adversity, nuclear families struggled, prayed, and remained together. As the dictatorship of relativism continues to cast a wide shadow over countries around the world, as the institution of marriage is threatened with redefinition, and as family life continues to decline and give way to an increasingly hedonistic culture that eschews the responsibility and commitment to life-long relationships, the task ahead of us seems daunting. The key to restoring an Evans family ethos lies within the Holy Family, who beautifully express the very heart and soul of marriage and family life. Authentic family values recognize God as the Supreme Being who creates and sustains all things, and who participates deeply, intimately and personally in a relationship of life-giving love with His children, made in His image and likeness. This mysterious communion is held together by what cultures recognized as its organizing principle: the preservation and strengthening of the “Life-Force” or “Power”, who has been revealed by Christ as the Holy Spirit. Filled with this Spirit, family life is to be lived with passion and energy, and simultaneously protected from values neutrality and human malice, hallmarks of an ever encroaching culture of death. When the family was threatened, the instinctive response within many cultures was to preserve and strengthen the Life Force by any means possible. Within our contemporary context, this means that the indwelling of the Holy Spirit is the sine qua non of family life. This assumes that the true nature of our faith is reflected in the way in which we relate both within the family and the created order, and that living in accord with the guiding principle of natural law (“do good, avoid evil”) synchronous with the fundamental tenet of Christian faith (“Love God and our neighbor as ourselves”), family life will naturally generate witness and actions directed toward the realization of authentic freedom energized by the power of the Holy Spirit. In short, by participating in the divine nature, families become centers of holiness. Families must challenge the pernicious influence of contemporary culture by building upon the solid foundation of our faith, a faith that forms the heart and soul of our spiritual identity as Catholics. “Inasmuch as all people are called to a life of holiness, [the family in particular, as the Domestic Church who is] faithful to the Holy Spirit and our Church’s teachings, must seek to pray and work in the spirit of our ancestors in the Faith” (National Black Catholic Congress, Congress IX, Spirituality Principle, 2002). Thus, in the spirit of the Holy Family and the saints, we must respond with courage, conviction, and unwavering faith to our baptismal call to holiness, to answer Christ’s directive to “be perfect as the heavenly Father is perfect”: to “shoulder the responsibility laid upon us by our Baptism into the Body of Christ. This responsibility is to proclaim our faith and to take an active part in building up the Church” (What We Have Seen and Heard, 18). This is the nature of covenant relationship within the family. Covenant relationship means making a complete gift of yourself to another in an outpouring of life-giving love; it is a relationship of sacrifice centered in love of God and love of our brothers and sisters made in God’s image and likeness. Covenant love is not the arrogant self-love of the culture that places the individual at the center of all meaning and existence, and where truth can be changed to fit one’s personal beliefs, situation, and circumstances. Within the context of family life, covenant relationship desires Jesus Christ above all else by seeking the good in each member of the family. Jesus Christ must be at the heart, the core, the very center of our family life. The better we understand and honor Christ’s role in the family, the more we will be able to love Christ present in each of its members throughout our lives. Emmanuel, who is the solid foundation of Catholic family life, and who in Himself established the new and eternal covenant, will constantly renew the marriage and family covenant. The witness of the Holy Family must serve as a constant reminder to our families that God alone is the fountain from which we will receive the strength, power, and grace that we need to help each other get to heaven.